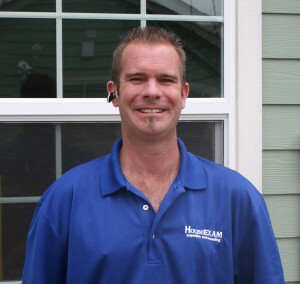 Adam Sedinger has been Employed with House Exam Inspection and Consulting since 2005 after working in the construction and remodeling industry for ten years. Adam is very proud to have been trained by and worked with his Father, Victor Sedinger, who founded the company in 2004. Adam was born in Lubbock, Texas, and graduated from North Central High School in Indianapolis, IN, in 1997. His course study consisted of all core classes during his 4-year term, as well as a two-year Construction Trades course at J. Everrett Light Vocational School, also in Indy. Adam graduated as Valedictorian of the class, and was awarded the “Golden Hammer” award at the graduation ceremony. After graduating High School, Adam worked for several commercial and residential construction companies, eventually starting his own company, in which he sought to further his knowledge of the construction trades, and the industry itself. He has always taken great pride in not only building the structures, but also making sure his customers were happy. With his father’s retirement in 2017, Adam became owner and President of House Exam Inspection. The company has provided inspection services for more than 9,000 Customers since opening in 2004. Adam is proud to carry on the tradition of accuracy, honesty, and great service to his clients. Adam’s hobbies include wood working, landscaping and spending time with his family.